We had plans to spend the weekend bikepacking overnight from La Crosse to Sparta and back (30 miles each way, camping in Sparta). The weather forecast looked good… the muggy upper 90’s would give way to dry air in the mid 80’s, with little wind. But it’s always the transition from hot to not-so-hot that creates trouble. Friday night (July 1) a strong wind blew through the house before we could get windows closed. Fridge magnets and the stuff under them were blown all over the kitchen. A large crystal was blown off a window sill. We later learned our area had experienced winds up to 80 mph. It started hard and suddenly, then died down after a few minutes. It started to feel like deja vu from the tornado we had in May, and it lasted about the same amount of time. 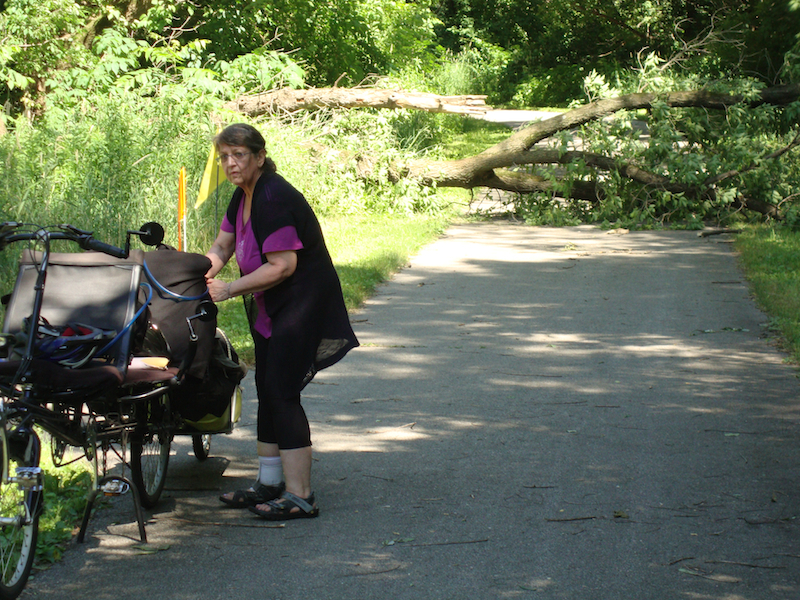 A downed tree blocks the city bike trail on the north side of La Crosse. Just to get across that first large tree, we would have had to take the bike trailer off the bike and then find a way to finagle everything over the tree. That’s not so hard on a regular bike, but it’s nearly impossible with a loaded 10-foot bike, plus a loaded 3-foot trailer. If there were just one tree we could probably deal with it, but knowing there were a lot more of them down, we decided to turn around and go home. Weirdly enough, we didn’t get any rain, just lots of wind and lightning. It did cool everything off though, and that’s a good thing. RoZ adjusts gear on The Limo after we turned it around at the down tree blocking the city trail on the north side of La Crosse. Obbie adds: This bike trail is a major connection to La Crosse for users of the state bike trail system. 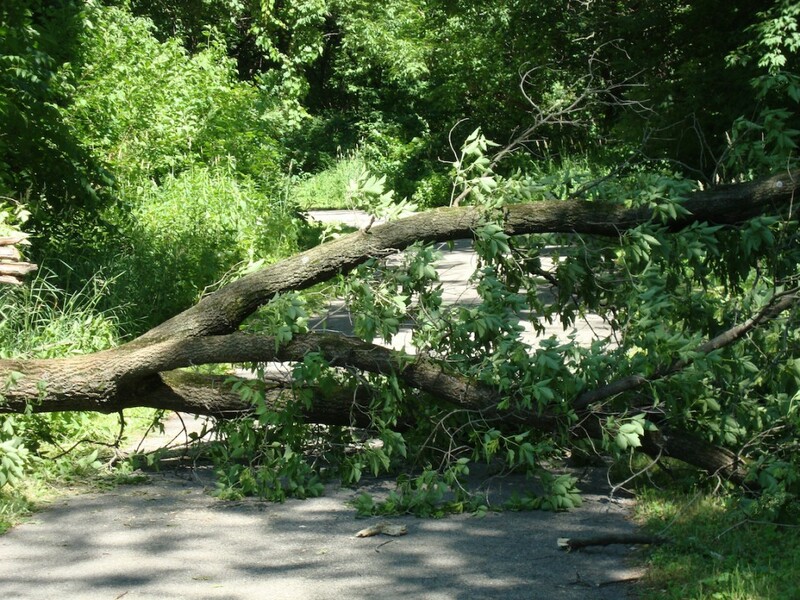 I wonder how long a local highway – or even a minor street – would be allowed to remain impassible due to a downed tree. We have a tasty Halloween treat for all of you tricksters out there: two hours of non-stop music from here, there and everywhere… something old, something new, something weird and something blue. Many Celtic traditions recognized this holiday as the beginning of the new year, so we end the show with the countdown from the Grateful Dead’s New Year show in 1990-91. This is not to be missed. Use this music for your party, or to just get into the spirit of the night preceding the Day of the Dead. For more information about Halloween, also known as Samhain (Sow-in), check out this website. Whirling Rainbow is produced by RoZ and engineered by Obbie. We hope you enjoy the show and we appreciate your comments and feedback. We went for a walk in Hixon Forest yesterday. It seemed like a good way to spend a hot day in July. So we were hiking on the Hickory Trail and almost at the junction to Lookout Point. We’d just come around a corner and I was walking in front. As we neared a tree in the trail Obbie yelled “STOP”. I looked down, saw a snake and heard it’s rattle all at the same time. I tried not to panic, although I wanted to run back down the trail as fast as I could. Instead, we stepped back and let the snake continue across the path and into the woods. A large rattlesnake crosses a trail in Hixon Forest. Close-up detail of the above picture. After recovering our senses we continued on up the trail to Lookout Point, with a lot more awareness of what’s around us. And respect too. Thanks snake, and Obbie, for the warning. This encounter reminded us of this silly but fun little Flash video. Watch for the snake. Happy New Year!!! May it be the best one yet. In honor of the new year we’ve put together a new Whirling Rainbow podcast – Whirling New Year. It’s a tasty mix of funk, jazz, rock and world that should put a smile on your face. And it might make you get up and dance too. It’s 1-1/2 hrs. long. We hope that you enjoy the show. Feedback is always appreciated. Our last show was a reaction to the immediate aftermath of Katrina and the abandonment of the people of New Orleans. In this program we reflect on the horrific and heroic things that have happened since. We’ll talk about things that everyday people are doing to take care of each other, the variety of ways we can each take part in the recovery, and the competing visions that are out there for rebuilding and resettling the Gulf coast region. And shouldn’t this parade of hurricanes be enough to motivate our leaders to do something serious about global warming? We’ll talk a bit about where they’re at with that.